Clay Art Center is pleased to present Freshly Funk, a solo exhibition featuring the sculptural works of emerging New York artist Lauren Skelly, running July 23- September 17, 2016. Freshly Funk features a site-specific installation and other abstract sculptural works exploring landscape, color and texture. The opening reception is Saturday, July 23, 6-8pm. Admission is free and open to the public. 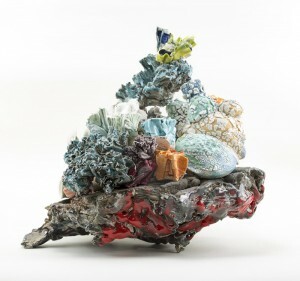 This exhibition was awarded to Skelly by a sub committee comprised of four esteemed New York curators Glenn Adamson, Barry Harwood, David McFadden and Jennifer Scanlan for her work entitled, “Cracked & Stacked.” Skelly’s work was included in a reginal juried exhibition curated by Leslie Ferrin of Ferrin Contemporary titled Tristate of Mind, held at Clay Art Center in early January 2016 as part of their year-long focus on clay’s integral role in New York art, architecture and design, entitled IN OUR BACKYARD. Tristate of Mind celebrated the work of 17 emerging ceramic artists working within a 75-mile radius of Clay Art Center.